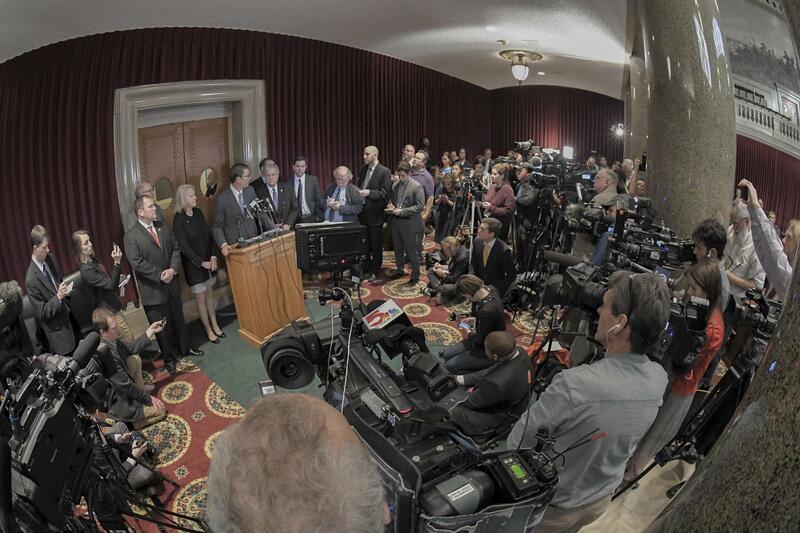 Scores of reporters look on as House Speaker Todd Richardson addresses the media on April 11, 2018. The release of House report on Gov. Eric Greitens' conduct is opening the door to impeachment proceedings. State Rep. Kathie Conway was one of the first Republican lawmakers to suggest that Gov. Eric Greitens resign. It was a move that set her apart from most of her Republican and Democratic colleagues, many of whom wanted to wait for more information to come out about a 2015 extramarital affair. Now, high-ranking members of both parties have joined Conway in calling for Greitens to leave after a startling House committee report. But Conway isn’t saying ‘I told you so.’ Instead, she’s lamenting how his refusal to step down may affect the business of state government. Listen to St. Louis Public Radio reporter Jason Rosenbaum's feature on why lawmakers may try to show Gov. Eric Greitens the door if he doesn't resign. House Speaker Todd Richardson said his colleagues may call themselves into special session after May 18, which would require signatures from three-fourths of House and Senate members. Democrats want the process to start now, contending that Greitens has no moral or ethical authority to lead Missouri anymore. But regardless of the timing, both parties agree that Greitens is in a prime position to be impeached and, if “eminent jurists” agree, thrown out of office. And given that Greitens’ relationship with lawmakers wasn’t that good before his scandal came to the public eye, GOP lawmakers aren’t happy that he’s lambasting people in charge of a House committee. The report from a committee of five Republicans and two Democrats featured testimony from a woman Greitens had an affair with before taking office. She accused Greitens of being sexually and physically abusive. Gov. Eric Greitens has said he won't step down, even as Republicans and Democrats call for his resignation. It was enough to prompt a slew of Republican and Democratic politicians to call for Greitens to step down, including U.S. Sen. Claire McCaskill, D-Mo., GOP Attorney General Josh Hawley and U.S. Rep. Ann Wagner, R-Ballwin. Even some lawmakers that had previously called for Greitens to go were shaken by what they read. But Greitens made clear on Wednesday he’s not planning on stepping down. Before the report came out, Greitens made a defiant statement to dozens of reporters: He said the report was full of lies and contended that his relationship with the woman who testified was consensual. And his felony invasion of privacy trial got a jolt on Thursday when his defense attorneys accused St. Louis Circuit Attorney Kim Gardner of “gross misconduct” for not turning over video of his accuser until after the House report came out. Still, the threshold for impeachment is different from being found guilty on criminal charges. And House and Senate members are laying the groundwork for Greitens’ ouster. Richardson wants to gather signatures from three-fourths of House and Senate members for a special session after May 18, when lawmakers could consider impeachment. If a special session happens, the House could then vote on whether to impeach Greitens. A majority vote of the House would be required for impeachment. That would prompt the Senate to pick seven members of the judiciary to decide the governor’s fate. Those judges would then have to decide whether Greitens should be removed for a litany of offenses laid out in the Missouri Constitution, such as moral turpitude. Democrats like Sen. Jill Schupp of Creve Coeur don’t want to wait until May to start the process. Impeachment proceedings, she says, should start immediately in the House. There’s ample evidence that Greitens will not fare well in an impeachment vote. Republican and Democratic senators stressed on Thursday that the outcome of Greitens’ trial will have no bearing on whether he gets impeached. It’s not out of the question that more revelations may come out in the coming weeks, since the House committee that issued Wednesday’s report can keep working until May 18. Even lawmakers that haven’t called for Greitens’ ouster, like Senate President Pro Tem Ron Richard, were taken aback by how the governor attacked people that put together the report. He was especially upset on Thursday that Richardson’s leadership was being called into question. Unless Greitens changes course and lets GOP Lt. Gov. 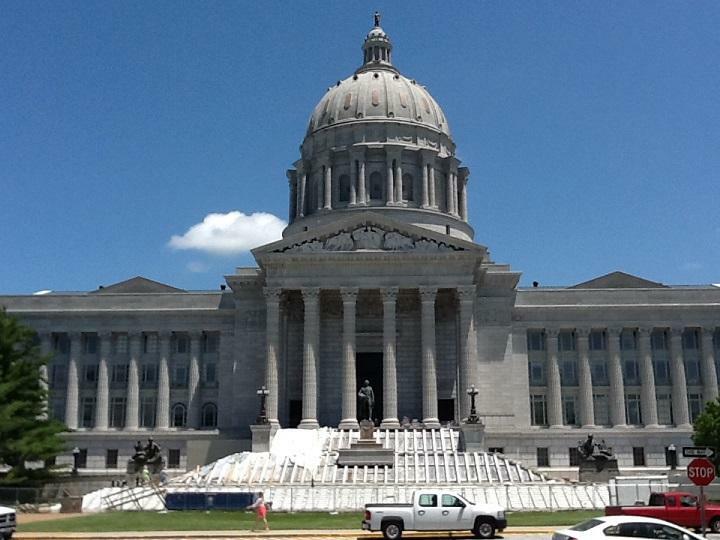 Mike Parson take the helm, Missourians will likely see the governorship be in a state of limbo for a few months. And that provides pause for Conway. Conway sees little way of continuing business as usual as long as Greitens’ tenure in office remains in flux. “To say that this isn’t disruptive or that we’re moving ahead is a falsehood,” Conway said. “Are we doing the best we can? Yes. Under the circumstances, we’re doing what the people ask us to do. We’re passing bills and working with the Senate. “But the whole thing is just something that was so unnecessary,” she added. On the Trail weaves together some of the intriguing threads from the world of Missouri politics. 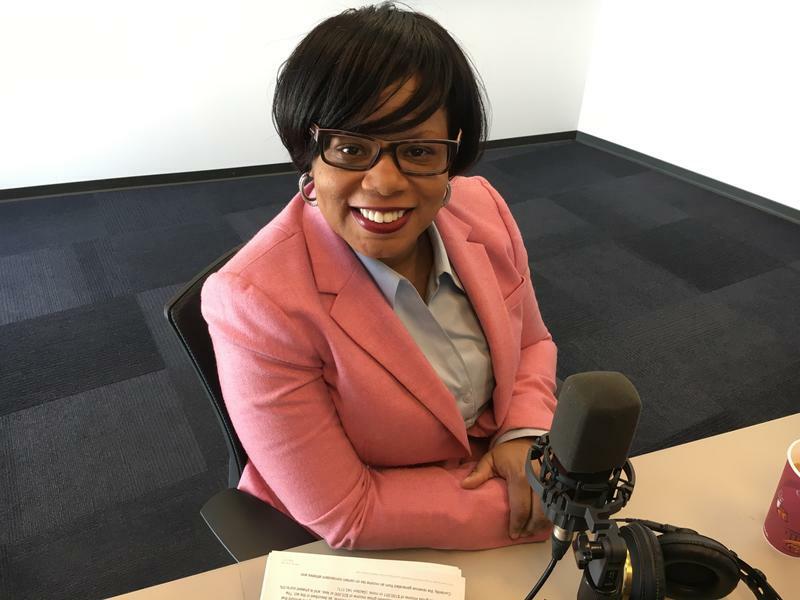 On the latest episode of Politically Speaking, St. Louis Public Radio’s Jason Rosenbaum and Jo Mannies welcome back Sen. Jamilah Nasheed to the show for the fourth time. Nasheed represents roughly half of the city of St. Louis. The Democratic official was first elected to her state Senate post in 2012, and was re-elected in 2016. Updated at 10 p.m., with comments from Greitens' former mistress' attorney. 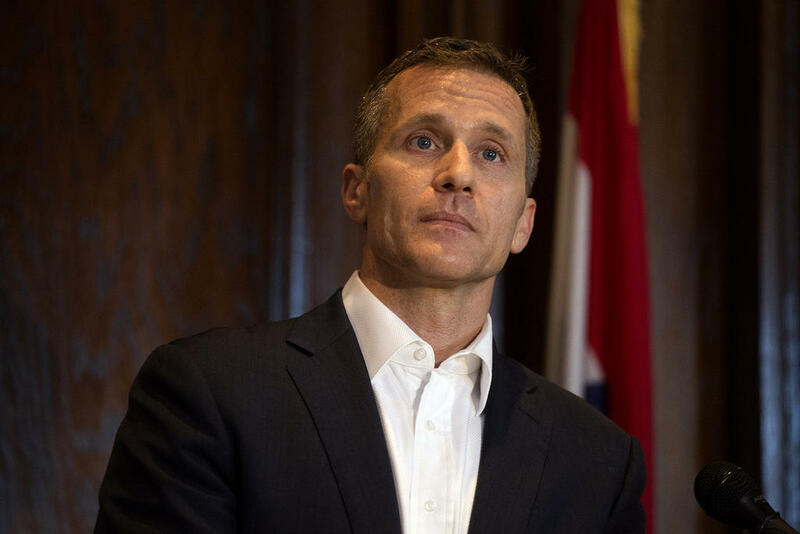 Greitens’ attorneys’ latest filing is getting fierce pushback from the lawyer for his former mistress, who said in a sharply worded statement that the governor's legal team was mischaracterizing her deposition testimony. It's the first time the woman has publicly accused Greitens of taking a photograph without her consent. The judge in Gov. Eric Greitens’ invasion of privacy trial is ordering attorneys, witnesses and parties to stop talking publicly about certain aspects of the case.